2009-9 is my happy, happy quilt made iwth Moda Fresh line. I should show the back as it is pieced with layer cakes of the same line. Just makes me smile when I look at it! 2009-10 is Gretchen Made Me Do It. 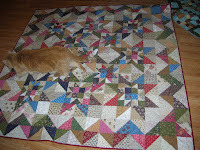 It is the scrappy quilt from the Quiltmaker magazine. I really like the way it came out. I guess I really love scrappy quilts! 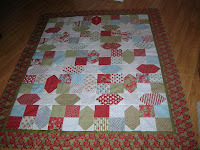 I have another one in mind from Quiltmaker magazine latest issue. It is called Winding Road and I just keep looking at the picture. It is a gotta do quilt! I seem to be having a blogging problem...don't know if this one will go or I will have 2! Celebrated Rob's tomoorow birthday by going to Taco Mac. Also spent some "quality time" with Sue watching some trashy vampire movie. Next projects for the baby: curtains after the room is painted and the dust ruffle! After stalling a bit this morning, I got down to business. The crib bumpers are now done. I decided to use rickrack for the ties. I found some pink that is the same color as the snails. Next I guess I need to make the diaper stacker. But that is for another day! While watching Teddy Kennedy's funeral mass this morning, I finished sewing on the binding on Gretchen Made Me Do It. All in all it was a productive day. Anyway I have been waiting all week. Now it is only hours until Party on the Porch. I am going with Becky and fellow Thimble, Sheila. Bad night for sleep last night. I have to pick up the prescription after work today. I didn't want to take it before the weekend because I don't know how it will affect me. Now I need to get some coffee and something for breakfast and then on to work. As the Friday song goes "I don't want to work, I want to play on the drum all day....."
Slow eek so far. 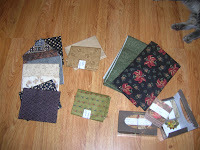 I picked up 2 quilts from Peggy and I am working on sewing on the binding. 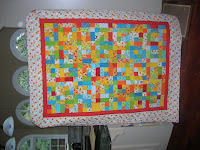 "Gretchen Made Me Do It" and a very happy summer quilt made from the Moda Fresh line. Makes me happy just to look at it! Pictures to follow. 36 hours and counting to Party on the Porch tomorrow night. I can't wait. Lots of laughs and bargains at Bed Melisa's Sweet Home. AND this is the weekend that is scheduled for bumper construction. I really must get these bad boys done. Baby Snugglebutt is due to make her arrival late October/early November. Baby shower is already scheduled. Her quilt is sketched out as well. Now I just have to do them! My plan was to take my completed quilts to Thimbles yesterday and take the pictures. Took the quilts, took the camera.....batteries dead. 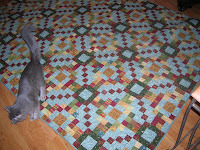 Best plans made....Anyway first picture is 2009-7 quilt from last year's quilt camp. Second picture 2009-8 Glory Bound. Henry and Willie checked them out and report them done! Thimbles went by way too fast. As usual we had a great time, laughed a lot and did not necessarily get much sewing done. But that is not the object. Being with these great people is what it is all about! Next Thimbles only have to wait 3 weeks!!! Also Party on the Porch is Friday night!!! Now that is not what Bad Melisa calls it. It is the Midnight Madness at Sweet Home. 9 to midnight. But the party begins on the porch way before the shop opens that night! It was sooo much fun last year. Hope someone lets the powers that be in Conyers know that that mob will be back on Green St on Friday night!! 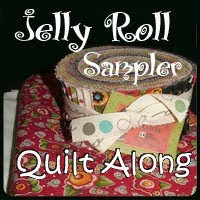 Call me wacko bananas...I have been looking at this particular quilt project since I first got the Lintott's new book...the followup to the Jelly Roll book. This one also adds layer cakes and other "cuts" to the mix. I always say...eat dessert first! Anyway, this week I started their "High Flying Geese"...page 30 in the book. I am using a jelly roll (!!!) and white background fabric. It calls for only 320 flying geese units. The block is rather small and the layout 5X8. I have decided to change it and make it 6X7. What is another 16 geese at this point. I guess I need my head examined as there is a new project at Thimbles this weekend. And baby snugglebutt has her needs too. I really MUST start on the bumpers or the child will be in kindergarten. I need to get on the stick!! later...now I need some coffee! HURRY UP THIMBLES!!!! I never posted a picture of 2009-7 either. It is the quilt from last year's quilt camp. 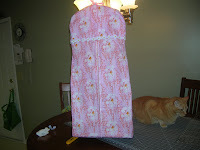 I finished the sewing the binding on it and never took the picture of the completed project. There seems to be a bit of a trend going on here! It is kind of big so I will wait until the weekend when I can get someone to hold it up for me at Thimbles. I finished sewing the binding on Road to Glory the night before last. I had intended to post a picture with the finished project but I think I will wait until Thimbles this weekend to take it's picture. I really love the way the quilt came out. I have not got the slightest clue where this quilt will eventually live. It really does not match a thing in my house! I am so glad that it is hump day. I am ready to play at Thimbles for the whole weekend! Last evening I slept on the couch from 7 until 10:30. Great I will be awake all night long. Not a problem...popped a benadryl and hopped into bed....woke up at 5! Evidently today is sister day (or something) so to all my sistas .....have a good one and a drink on me!! I think Gretchen said that first and I agree! And then there is BAD MELISA! Tomorrow is her big birthday so I guess I should not be mean to her. But I was totalling up my recent receipts from Sweet Home and discovered that I have been very, very, bad. Since March I have been there, on average twice a month. I had no idea!!! And I certainly am not going to divulge the total of my receipts in that time period. Suffice it to say the Evil Temptress has done her job well!!! And now I am going to sew binding on Glory Bound. I will bring it to Thimbles. 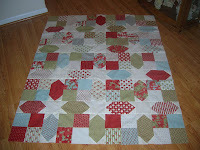 Vicki did the quilting on this one and it is gorgeous! Today I feel a bit better than yesterday. Actually, a whole lot better! I went to work because .....well because that is the way I am. I took the drugs with me. I found some not so bad for people with high blood pressure drugs and now I can actually breathe. Breathing is such a good thing! And now I am back at home. I stopped at the library to pick up a book that I had reserved. American Made by Nick Taylor. I got to know Nick several years ago when he was writing a book about the church I attended in NY. I was looking at titles of authors that I actually know. I know 3. Nick, my nephew Chris Bohjalian and Elisabeth Lee. She has just published her second novel. I need to find that one too. At any rate, Nick's book is about 8 million pages long, dealing with the WPA and the Roosevelt years. At least I won't be crying in this one as I was in Ordinary Miracles. 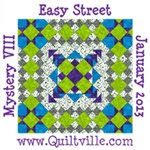 But the dilemma is the next block arrived in the mail from Fat Quarter Shop. It looks like a doozy but i want to do it anyway RIGHT NOW. When I woke up this morning, I knew that I was coming down with a cold. Well, actually I was pretty sure last evening. I hit the vitamin c but it has not made much difference. I hate having a cold. I feel yucky. I stopped on the way home and got wonton soup. I have spent the evening sleeping on the couch. I KNOW I will be at all night or at least from 3AM on. This is not something I am looking forward to as there is nothing on tv at that hour except maybe poker! Sue posted pictures on her blog of the first day of school. I can't believe that my little Emma rides the school bus. (A little bit of my history now). I loved the first day of school when the girls were little. The long summer was over and we were back into the routine. One year i even toasted the school bus driver as he arrived to take all the neighborhood kids off to Ben Franklin. But this is different. I couldn't believe that I actually got a lump in my throat when looking at the pictures. I guess I will just chalk it up to old age! The heat goes on and I am going to bed! Maybe at 3AM I will just get up and sew. I am working on whittling down the UFO's. I have a "mystery quilt" from the reatreat I went to in Florida. The block is 10 inches finished. The fabric is from American primer. I need to find another block to go with this one. 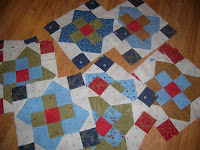 I have 12 blocks and had it sewn together but it just doesn't do anything for me. I am planning on navy latice work with a cornerstone. But I need some suggestions on adding an alternate block. I REALLY wanted to go to Sweet Home today but I have so many works in progress, I decided to finish up some stuff today. (Besides-the sale is all week. I can always go after work next week). This the top I made from the second jelly roll book. It needed a border to stop it. I like it much better now. Inner border is one inch finished and the outer border five inches. I am happy! Think I will go see what else could be finished up this weekend. I was on a roll last evening and started sewing. 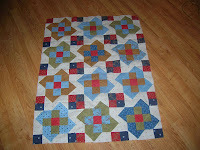 When I looked at the picture I posted on the blog last time, I realized that I had made a mistake on one of the blocks. A little unsewing and I was good to go! After I constructed a few blocks, I just kept sewing. I finished them this morning. Now I am trying to figure out how they will go together. I know they will be set on the diagonal because of the gold fabric I have cut. If Willie will let me, I will lay the blocks out on the floor and arrange them. I had figured out Orange Crush ahead of time but this one is currently a puzzle! I guess I should do some chores before I play! Bad Melisa has a sale on Moda...ahhhhhhhhhhh. I want to go!!! I had to finish (actually pretty much start) part 1 so I could play on part 2. This is going to be s great pattern I think. 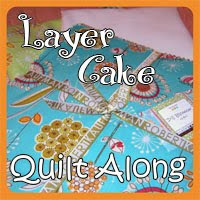 But that will have to wait until the next issue of Quiltmaker-probably out in October. I should be able to get this part done by then! Willie was checking out my seams-most of them are pretty good! And on another totally unrelated topic..i wonder why no one has ever written a book about a nursing home. of course there is some sadness there but there is also some pretty funny stuff. I would title the book "There is Always a Full Moon at the Home". I was sitting at the nurses station this afternoon and was reviewing orders written on a new resident. Her meds came with her including rsaberry flavored morphine! I just had to giggle. And then I went with that thought..suppose you could make frozen morphsiciles.... I guess I just need a vacation about now. I had to do something this weekend besides sleeping and eating, so I decided this morning to look at my to do list. 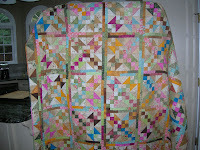 This quilt top is from the book Layer Cake, Jelly Roll and Charm Quilts by Pam and Nicky Lintott. The pattern is called Hidden Stars. I used the layer cake that I bought at Sweet Home last weekend plus a yard of fabbie for the stars. The layer cake is Winter (Minik & Simpson) by Moda (of course). It is a quicky. I did it start to finish today. It does not call for a border but I am not too sure that I like it this way. To me, it looks like I didn't finish it. We'll see. It is a small quilt so adding a border will not make it outrageous. Sleep continues to elude me and as a result, I was awake at four thirty again this morning. I got up and had coffee and then plopped back on the couch and dozed until about nine. I did manage to do a load of laundry today but that was pretty much it. Oops, I forgot I did make binding for the Fresh quilt that I gave to Peggy. So today-some total: sleep and eat. 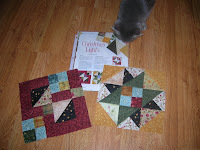 I read a magazine that came today-American Patchwork and Quilting. A couple of interesting patterns BUT yesterday the new issue of Quiltmaker arrived. Part 2 of Bonnie Hunter's Christmas Lights. 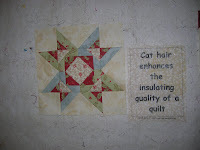 (Haven't finished part one yet.And there are 2 other quilts that are really interesting. One is a scrappy stash buster. Also a Halloween wall hanging that is kind of cute. I guess I will put them in the maybe someday pile. I am hoping that I am able to get a decent night's sleep tonight. On another note: Willie is doing fine. I didn't give him any pain medicine last night because I didn't think he was bothered by it. Today we have chilled together and he is running around the house. As for the shouldn't jump...yeah right he doesn't get the concept. He just learned to jump up on the counter this week. I am glad to have him home. I can't say that Spooky and Henry feel the same. 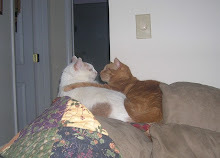 Spooky just does not want to tolerate him at all.